(L) Broadway and regular route. Southbound: Regular route to Pasadena Ave. & Ave. 19, then continue via Pasadena Ave. to (L) Ave 18 (R) Spring St.- Alameda St., (L) Cesar Chavez Ave. and regular route. Line 92 Northbound: Depart the terminal via Main St. to (L) Olympic Blvd., (R) Hill St., (L) Temple St. and regular route. Southbound: Regular route to Temple and Grand Ave. then continue via Temple St. to (R) Grand Ave., (L) Olympic Blvd. to Main St. and regular route. Línea 96 Southbound: Regular route to Hill St. and Ord St. then continue via Hill St. to (R) 1st. and regular route. Northbound: Regular route to Olive St. and Olympic Blvd., then continue via Olympic Blvd. to (R) 9thSt., (L) Hill St., and regular route. Línea 460 Eastbound Only: Regular route to 5th St. and Wall St., then continue via 5th St. to (R) Los Angeles St., (L) 3rd St., (L) Broadway, (R) 5th St., (L) Grand Ave., (R) 8th St., (L) Flower St. and regular route. Línea 487 Westbound: Regular route to Spring St. and Aliso St., then via Spring St., (R) Temple St., (L) Grand Ave., and regular route to Wilshire Blvd., and Union St. then continue via Wilshire Blvd. to (R) Westlake St., (L) 6th St., (L) Alvarado St., (L) Wilshire Blvd., to temporary layover zone, nearside of Bonnie Brae St. Eastbound: Depart temporary layover zone, and regular route to Olive St. and 2nd St., then (L) 1st St., (R) Grand Ave., (R) Temple St., (L) Spring St. (Contra-flow) and Regular route. Línea 603 Northbound: Regular route to Hoover St. and James Wood Blvd., then continue on Hoover St. to (R) 8th St., (L) Alvarado St., (L) 6th St., and regular route. Southbound: Regular route to 6th St. and Coronado St., then continue via 6th St. to (R) Alvarado St., (R) 8th St., (L) Hoover St. and regular route. Línea 620 Southbound Only: Regular route to State St. and 1st St. then continue via State St. to (L) 4th St.to Soto St. and regular route. Línea 733 Eastbound: Regular route to Main and 11th St. then continue Main St. to (L) Olympic Blvd. (R) Hill St., (R) Temple St. (L) Main St. and regular route. Westbound: Regular route to Spring St. and Aliso St., then via Spring St. (R) Temple St., (L) Grand Ave., (L) Olympic Blvd., (R) Main St. and regular route. Línea 745 Northbound: Regular route to Broadway and 9th St., then (L) 8th St., (R) Hill St., (R) Temple St. (L) Main St., (R) Cesar Chavez, and regular route. Southbound: Regular route to Cesar Chavez and Main St., then continue via Cesar Chavez to (L) Grand Ave., (L) Olympic Blvd., (R) Broadway and regular route. Silver Line Northbound: Regular route to Olive St., and 2nd St., to (L) 1st St., (R) Grand Ave., (R)Temple St., (L) Spring St. (Contra-flow) and regular route. Southbound: Regular route to Spring St. and Aliso St. to (R) Temple St., (L) Grand Ave., (R) 8th St., (L) Flower St. and regular route. 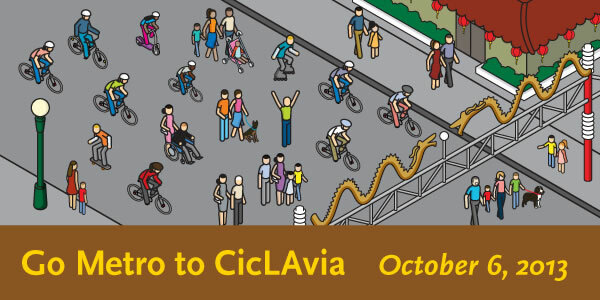 This entry was posted in Bicycle and tagged bus detours, CicLAvia, Metro Rail by Steve Hymon. Bookmark the permalink.